Whether you are stopping by from a cruise, or visiting the state of the art Acquario di Genova, or stopping in to dine at Genoa‘s many beautiful restaurants situated on the palm tree lined dock of this fishing town for seafood caught fresh from the morning’s catch, Genoa is a lovely must visit city by the sea. Located in Italy’s northern region, Genoa is Italy’s principal seaport and is located on the northwest coast of Italy in the region of Liguria near the French border. Since the Middle Ages, the aristocratic families of merchants and sailors used to settle in Genoa’s ancient downtown, living in lots which were strictly controlled by the families themselves. In the 16th century, those families decided to build new streets and palaces, and they created that extraordinary urban heritage known as Strada Nuova: an elite district characterized by a modern public allotment system and a series of houses aligned along a 250 meters long straight stretch of street. The houses were where the Genoese merchants, bankers, and financial experts hosted emperors, kings and ambassadors. The city gives you a perfect blend of modern and historical. 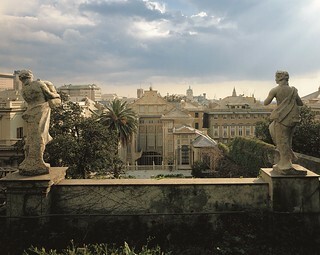 Today the buildings owned by these aristocratic families, built to accommodate the guests of the Republic of Genoa, are home to banks, event halls that can be rented out for special events (including weddings), the city’s Chamber of Commerce, Town Hall, clubs, cultural groups, antique dealers, shops, and public and private offices. The best way to experience the allure of some of these dwellings is by viewing it up close. Take one of the guided tours organized by the city, and you will lean all about the history and regions recognized by the UNESCO World Heritage Site. 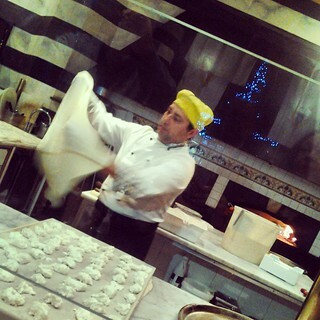 The cuisine of Genoa tastefully reveals the character of the land and the ingenuity of its people. With simple cooking methods and an abundance of vegetables, herbs and olive oil – plus a dash of unique creativity – the Genoese have skilfully invented dishes that are authentic, flavourful and extraordinarily enticing. I was lucky enough to view a cooking demonstration and tasting at pasta with pesto I TRE MERLI Porto Antico, an authentic Genoese restaurant located on the port. 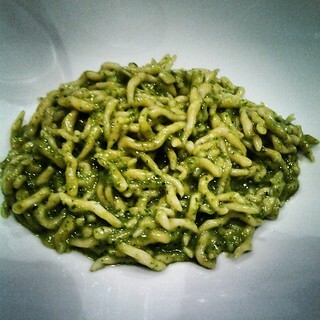 The restaurant serves up all of the region’s most famous specialities pesto and focaccia, which is served both plain – flavoured only with olive oil – and in an array of tasty variations (topped with onions, olives, sage, cheese, etc.). “Genoa enchants me … is it possible to eat better anywhere than in Genoa?”. In Genoa, l’aperitivo (a happy hour including appetizers or an open buffet) is a must that few are willing to pass up on: enjoyed in historical, traditional, or trendy pubs, in the old taverns and bars found throughout the region, in museum cafeterias, and at countless sidewalk cafés. The array of international drinks and natural beverages offered include, at least two specialties that are not to be missed: a “gotto” (Genoese for ‘glass’) of Ligurian white wine served with the region’s famous focaccia, and the “baxeichito“, a cocktail featuring the region’s fabulous basil. The most popular pubs and bars for happy hours are undoubtedly those in the historic center, especially in the areas of Piazza delle Erbe, Via San Donato and Via San Bernardo, and throughout the Old Port. So there you have it. A recap of one of the must visit cities in Italy. It is a place of history, innovation, delicious food, and traditional beverages. So hop on a flight to Italy, book your stay at one of the city’s most beautiful and historic hotels, the Grand Hotel Savoia Genoa. And experience the city! Ciao!